Since the Gutenberg Bible first went on sale in 1455, printing has been viewed as one of the highest achievements of human innovation. But the march of progress hasn't been smooth; downright bizarre is more like it. 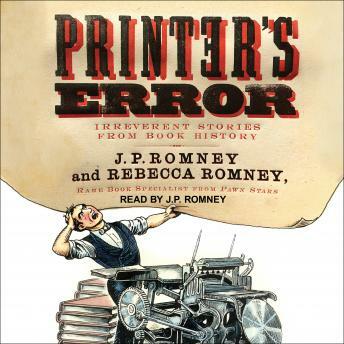 Printer's Error chronicles some of the strangest and most humorous episodes in the history of Western printing. Take, for example, the Gutenberg Bible. While the book is regarded as the first printed work in the Western world, Gutenberg's name doesn't appear anywhere on it. Today, Johannes Gutenberg is recognized as the father of Western printing. But for the first few hundred years after the invention of the printing press, no one knew who printed the first book. This long-standing mystery took researchers down a labyrinth of ancient archives and libraries, and unearthed surprising details, such as the fact that Gutenberg's financier sued him, repossessed his printing equipment, and started his own printing business afterward. Like the works of Sarah Vowell, John Hodgman, and Ken Jennings, Printer's Error is a rollicking ride through the annals of time and the printed word.